Local businesses tend to be easy to service (because of limited competition), but tend to be hard to service profitably (due to big demands and small budgets). Only the local interactive segment will show growth throughout the forecast period. All other local media will experience marginal to rapid declines in the next 18 to 36 months. A small number of traditional media will rebound with a revived economy beginning in 2011, though most traditional media will continue to decline, albeit at a slower pace. In a bid to get more local advertisers to buy search ads, starting this week Google is trying out a new type of search ad and pricing system in the San Francisco and San Diego markets. Rather than ask businesses to set up a campaign and bid for keywords, they’re offering local advertisers (or non-advertisers) a search ad for a flat fee. The fee is set by Google and based on the average that similar businesses are paying for a given keyword in that market. The fee is set by Google and based on the average that similar businesses are paying for a given keyword in that market. So Google is using your keywords and your bid prices to automate setting up accounts for competing businesses. You pay them for traffic and they arbitrage your efforts by using you as a free market research tool for competing businesses. And imagine if/when Google has 5 companies in your market all bidding based on the same flat fee average strategy. Some keyword prices could fluctuate wildly as the house decides to arbitrarily bid up or down a particular keyword or basket of related keywords. Nick mentioned that keywords were used as a proxy for relevance. Conceptually, there is no reason an advertiser couldn’t achieve the same results without having to directly manage a keyword list. Down the road, Google wants to state outcomes and have machine-based learning and algorithms come up with the best method of achieving specific outcomes. In the case of no keyword search, an advertiser (like a retailer) would provide information on products, product descriptions, pricing, etc. and Google would use the information to find the most effective way to place ads in front of potential customers. Those machine-based learning algorithms need input to become efficient. What happens if you share your conversion data with Google? This is one of the areas of opportunity on the web for 3rd party analytics providers. As Google continues to make advertising easier (and seemingly cheaper – at least up front) there will be added value in operating outside of their ecosystem and/or limiting how much data you hand over to the borg. Presumably as this gets easier to automate and test it will increase the value of related services like website design and conversion testing (until those are automated and commoditized as well). But some smart business owners who enter the search game via these automated technologies will likely eventually want more granular control of their strategy, as it is hard to build a long lasting sustainable business based on market averages – especially when the fox is guarding the hen house. Over time those who evolve their model to increase lifetime customer value, increase conversion rates, and build distribution outside of search will eventually make the average price too expensive for an average business to be able to afford advertising. How do ad networks that nobody has ever heard of create enough inventory to pull in premium advertisers? It’s simple: create it! Many of the sites in these exchanges use multiple layers of I-frames, which further complicated efforts to track campaigns. Sites are able to hide fraudulent traffic behind numerous layers of nested I-frames, leaving advertisers blind to in-view data, according to the study. Mpire believes the default trafficking behavior of many RON buys is to include fraudulent and well-known botted sites. Gluck writes in the study that not all marketplace or exchange traffic is bad, but rather simply includes nefarious inventory that ad networks could block, but for some reason do not. If you are a legitimate advertiser using these networks, they are stealing your money. If you are a legitimate publisher your inventory is being priced down because it is being priced against, compared against, and often sold in a bundled package with pure fraud. Even if you choose not to sell ads in the ad exchanges, your media is still being compared against the garbage, and the garbage is driving down the perceived value of your inventory. Thus many of these ad exchanges are a perfect mixture of the tragedy of the commons and a market for lemons. A few years ago I remember listening to a sleazy affiliate marketer talking about how mixing your traffic in with other traffic was a benefit. No wonder, as guys like him were working the iframes + pushing cookies + using bots to view pages and click ads and fill out lead generation forms. He was operating at a criminal level, stealing from whoever he could, but had yet to go to jail. Every network that collects leads has buckets of different quality levels. SEO and search PPC tend to be toward the top, as search is pure as the snow. And then the volume guys tend to fill up quota with trash. On average the quality is good enough to keep selling it, but the premium quality stuff is being discounted by the people who are mixing junk into the equation. When we designed a Behavioral Targeting Ad system, it was quite obvious that RON Ad networks always exhibited a higher click thru rate but very low click to buy rates. Our suspicion was that these sites had some mechanism that ‘simulated actions’. When we analyzed the IP addresses, the first node was always the same, clue to either bot controlled or site controlled robot clicks. How big of a hit are some publishers taking from this fraud? Well Yahoo! didn’t allow advertisers to opt out of their content network when buying search traffic, and consequently some of their search traffic was priced at only ~ 1/3 of what the same click would cost from Google. It is no wonder Yahoo! had to sell off their search assets when they were being out-monetized 3:1 on core keywords (due in part to fraudulent traffic partners). And the cost to non-search publishers in these ad exchanges is likely even greater than it was to Yahoo!, since there is so much more watered down inventory (relative to legitimate inventory) in such ad exchanges. At its worse, about half of Yahoo!’ Searches ad clicks came from search, whereas some of these ad exchanges have their legitimate inventory measured in the single digits! This leads back to why the price of a search click is often higher than what some affiliate networks or advertisers pay for leads: because the search traffic is real & targeted, unlike a lot of robotic and incentivised traffic sources. Search converts higher, and often has a higher average conversion value. Plus who has time to sort through thousands of fake leads each month? They not only offer no value, but they also waste time that could be spent further qualifying and servicing the legitimate leads! Want to read the Mpire’s full report? Download it hear. When you buy ads direct from a publisher they usually charge a premium rate above what that ad inventory would sell for if it was sold through an automated ad auction. When Google launched site targeted AdSense ads years ago it was a cheap way for advertisers to buy specific audiences. Perfect for brand advertisers, but not as good for direct marketers. Why? It turns out that when you buy site targeted ads you typically first get exposure on the least valuable pages and least valuable ad units within a site. It makes sense that if all you want to do is advertise on a particular site then of course Google is going to sell you the inventory they struggled to monetize with their traditional keyword targeted PPC ads. So if the site has an offbeat category, or an AdSense ad block that is below the fold in the right column, those are the ad positions you are buying first. You can buy your way into the more premium positions on the best pages too, but in order to do so you must bid high, which means you end up bidding at premium rates on the best pages, and you end up bidding too high for the backfill / remnant ad inventory on the least valuable pages. Not only are you losing money buying that off targeted backfill inventory, but you are competing against the most targeted ads on the most valuable pages, so it is hard to make money from buying site targeted ads unless they have a small niche site or are in a category where the ad market is exceptionally inefficient. There are some hacks around the issue of wasting money on site targeting though. The easiest of which is to look for footprints (URL, footer text, author name, etc.) on a site or the section of the site you want to advertise on and bid on those related keywords. If there is a section of the site that is irrelevant you can look for related footprints that are specific to those pages and use them as negative keywords. Who Chopped Off PPC’s Long Tail? Google is more selective with distributing ads than other search engines are, and tends to not show advertisements on many hard to monetize longtail queries. When Google does show ads on longtail queries they generally are showing ads for head keywords via their broad match and automatic matching options. Many of the lower end aribtrage plays have been killed off through search ad quality scores. 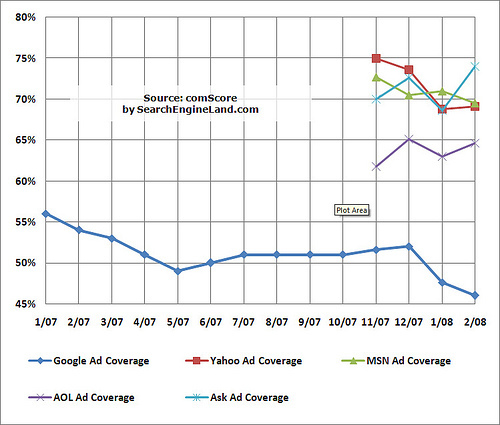 This SearchEngineLand chart compiled from comScore research shows that Google shows fewer ads than most of its competitors do. So part of Google’s solution for the long tail is to ignore monetizing it to offer a better user experience and win marketshare. Google is definitely heavily testing this recycling of ads concept and the new automatic matching. When you think about it, though, filling up the ad space to a user for a tail term with an ad they saw previously is a pretty brilliant tactic on Google’s part, as long as users don’t revolt. Instead of lowball affil & arb ads or white space, a high quality advertiser from a previous search gets re-shown, and another chance to make an impression. With the way Google AdWords is heading it seems the key to dominating the tail of PPC is to dominate the head – improve your conversion rates and value per visitor so you can bid more aggressivley and use broader matching options to get the additional longtail exposure. On organic search publishers still have many options on the longtail front (publishing niche content, guest articles on authority sites, exact match domain names, etc. ), but some of those are disappearing through the promotion of mega-authority broad sites like Wikipedia, About.com, and even newcomers like Mahalo. If Yahoo! would just allow searchers to opt out of arbitrage traffic and syndication fraud their click prices would come up and they could serve their own head keywords across the long tail. But if they let Google serve too much of their inventory before they fix the syndication problems they will never have a chance to fix it in house. For $25 this database is a great investment if you are run geo-local AdWords campaigns using tools like Speed PPC. This video offers more background on the United States zip code database.